Basic Description - Electronics - Built along some of the same lines as the famous R-390 receiver, the Collins R-389 is essentially the LF companion to the R-390 receiver, covering 15kc to 500kc in one tuning range and 500kc to 1500kc in the second tuning range. The R-389 uses very complex methods, both electronic and mechanical, to achieve its complete MW, LF and VLF coverage while still utilizing a 455kc IF. 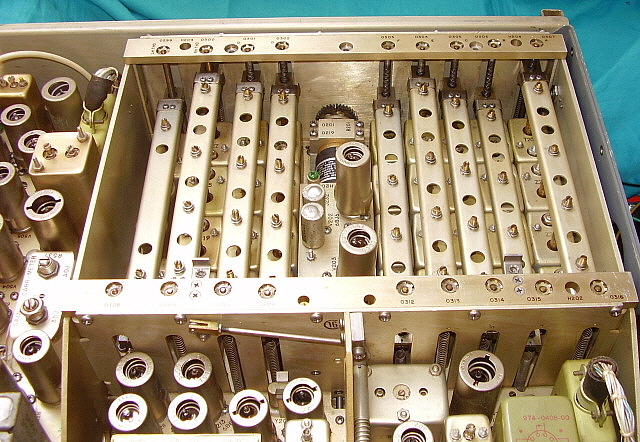 The receiver uses 36 tubes within five modules that interconnect and are mounted within the main frame. The 15kc to 500kc tuning range utilizes five permeability-tuned RF bands. The 500kc to 1500kc tuning range utilizes two permeability-tuned RF bands. The band switching is motor-driven and occurs seamlessly as the receiver is tuned from the lowest to the highest frequency within the two tuning ranges. From the second mixer circuit on, the R-389 utilizes the same modules that are found in the R-390. That would be the six-stage IF module, the two channel audio and electronic voltage regulator circuit module and the power supply module. Although the 70H-1 PTO (VFO) looks exactly like the one in the R-390, it's very different inside and tunes from 470kc to 1955kc. Mechanical Details - The manual tuning of the receiver RF front end uses clutch-coupled gears to rotate the main RF tuning shaft that has worm gears that perpendicularly engage and rotate the gear-driven front and rear line shafts that have worm gears that in turn engage gear-driven vertical screw-shafts (cut with forward and reverse threads) that raise and lower the various slug racks. When this gear-driven system is correctly adjusted and lubricated sparingly with light-weight oil it will be easy to manipulate and have the feel of a good condition R-390A gearbox. Since the two tuning ranges cover so much spectrum a clutch-coupled, motor-drive tuning system is provided. 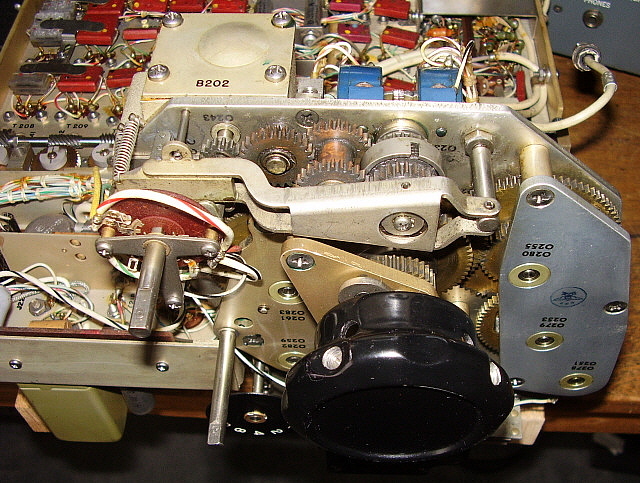 A separate motor-drive band switching system is also provided to select the proper band (one of seven) to allow seamless bandswitching as the receiver is tuned throughout it ranges. 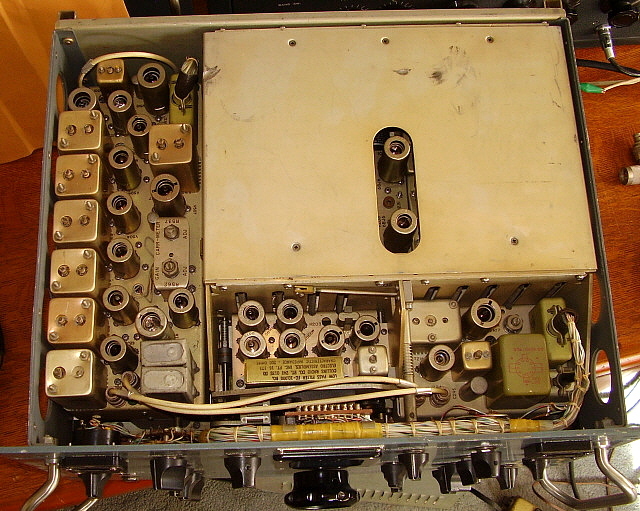 photo right: Top of the R-389 showing the RF module and IF module mounted in the receiver. The RF module has the slug racks located under the cover. The two tubes showing thru the opening are the two RF amplifiers. The Crystal Oscillator and first mixer is the to the left and the second mixer is to the right. The IF module is to the left side of the main frame. >>> The AC power connector is a four-pin military connector that is keyed and held in place with a central screw that has a fold-down, wing-type handle. There are at least two different types that fit,...sort of. The original (CX-1358/U cable + connector PN) connector has a small round cylinder-shaped housing with a cable exit tube on the side. This type will fit in almost any orientation and can be used if the receiver is installed into a table cabinet. There is also a large square housing with the triangular top type that will only fit in one orientation that won't interfere with the terminal strip or the fuse housing. With the larger connector installed the receiver must have spacers to elevate the bottom enough for the connector body (if the receiver is setting on a table) to clear the table. Also, with this larger connector, the receiver won't fit into the table cabinets. Unlike most other LF and VLF receivers, the R-389 doesn't have any fixed-circuit audio restrictions within the audio module other than the switch-selected Broad-Medium-Narrow. Selecting Broad results in a fairly wide audio bandwidth. Medium is shaped for voice with noisy conditions and Narrow is a bandpass filter at 800hz for CW. The IF bandwidth can be restricted down to 100hz. Both 100hz and 1000hz IF bandwidths use a crystal filter that's onboard the IF module. The 2kc, 4kc and 8kc IF bandwidths are determined by the IF transformers and Q-resistor set-up. For static bursts and other types of atmospheric noise, the dual positive-negative noise limiter is available. When tuning in the AM BC range, the receiver's bandwidth can be increased to 8kc and BROAD and, with no other specific audio restrictions, the resulting audio isn't too bad. However, the audio is more-or-less communications-grade audio so don't expect high fidelity because it isn't. Most listening on LW will usually be using a headset. Most listening on the AM-BC band will be on loudspeaker. 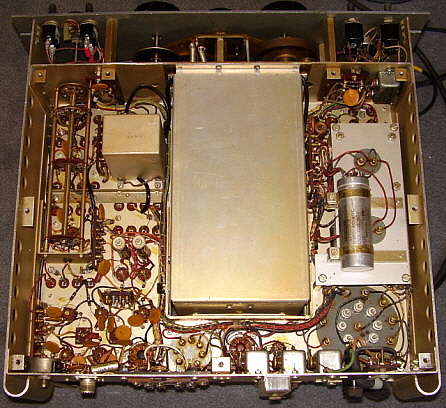 photo right: Bottom of the R-389 showing the Power Supply module on top, the VFO in the center and the Audio and Electronic Voltage Regulator module on the bottom. Motor drive system is directly behind the front panel. The long rectifier (green with fins) is part of the motor-drive tuning power supply. The long bent metal arm directly behind the tuning knob is the motor-drive clutch actuation arm that is cam-driven from the MOTOR TUNE control. The three coaxial cables behind the VFO are from the Antenna Relay box and are routed to the RF Module. This probably isn't really a "restoration" but more of a full and complete "servicing" of the R-389. Includes the removal of any "non-military" modifications in order to return the circuit to the original design. Before starting it's worth noting that the receiver does function - not to spec, but it does receive some signals. This indicates that most circuits are working but probably not aligned where needed. The R-389 is a very mechanical type of receiver and this servicing will probably include not only electronic alignments but also mechanical alignments. April 17, 2018 - The Carrier Level meter wasn't the correct style. I've been unable to find a suitable one on eBay or from other sources. I decided to harvest a Carrier Level meter from a junk R-392. These meters look similar to the meter used in the R-389 but the scale is slightly different. Original meter FS was 100db and, although the R-392 meters have 100db as the highest number shown, the scale goes one more graduation beyond (or around 120db FS.) Also, the R-392 meter has "DB CARRIER LEVEL" on the meter scale where the R-390 meter just has "DB" on the scale. Additionally, the meter case is actually slightly larger. When mounted, the meter is in contact with the beveled spacer on the grab handle. It's a tight fit but it will fit. One other problem is the meter FS current is slightly different resulting in a fairly "stingy" meter reading. So, I spent a couple of hours harvesting the R-392 meter and installing it into the R-389. It was a waste of time because the very next day an original R-390 Carrier Level meter came up on eBay. When it arrives, I'll replace the R-392 meter. April 19, 2018 - Aligned the IF module. 455kc IF transformers slightly off. Gained about 1 vdc on Diode Load after 455kc IF transformer adjustment. Crystal Filter off quite a bit, especially the core adjust that equalizes the output on the .1kc and 1kc positions. AGC adjustment off quite a bit. About one full turn of the adjustment to attain maximum AGC voltage. Ended up with increase of +10db on CL meter. >>> >>> Performed the alignment on the VFO output stage, the Injection Mixer stage and the Output Coupler stage. This requires a RF probe and VTVM to monitor the test jack level and adjust for maximum output. The RF signal generator is not required because the circuit's crystal oscillator is used as the signal source. Alignment was fairly close but still some improvement was gained. Another note,...this was a good test for the motor drive system because alignment points are at the extremes of the tuning range. Motor drive worked great with no hesitation or bogging-down - just fast and easy to go from 15kc to 500kc or from 500kc to 1500kc in about 30 seconds or less. After all of the repairs and the alignment, I used the receiver for awhile. When installing a new Twin-ax to BNC adapter on the Balanced Antenna input, I happened to notice that the OVEN was turned ON. I checked the manual and read that the oven was only on the VFO and was designed to raise its internal temperature up to 167ºF - Wow! Anyway, I started testing the R-389 with the VFO oven off. The frequency "jump" never happened after I turned the OVEN off. I left the receiver turned on for hours and always the tuned frequency remained 20kc low. >>> >>> In thinking about this problem, I knew that I hadn't synchronized the VFO as I always do on any R-390A that I align. On the R-389, at 15kc, the VFO output should be 470kc - exactly. I used a tube extension to access pin 5 of V702, the VFO buffer output tube. I used a digital frequency counter to measure the frequency exactly. It was 452kc at 15kc on the Frequency Dial. I had checked the mechanical limit-stops prior to this and those were okay. I assumed that in the past during an alignment someone skewed the VFO to correct the frequency readout with the VFO oven ON. I loosened the clamp on the VFO coupler behind the gear-driven mechanical limit-stops. This allowed me to just change the VFO only. I set the VFO for 470kc output with the frequency set to 15kc and tightened the clamp. I then checked the DGPS node at 314kc and it was at 313kc (BFO on) and I also checked local AM BC KOH 780kc and it was at 780kc with the 2kc bandwidth. A "touch-up" on the alignment was going to be required. Actually, the adjustments below about 150kc were pretty far out. The higher the frequency, the less the alignment was affected. More details in the next section below. Be sure to read the update for Jan 9, 2019 (below) for more info on this VFO problem. R-389 UPDATE: Oct. 1, 2018 - Tuned in LLD 353kc in Hawaii at 0545 this morning using 100'x135' "T" wire antenna. Also, tuned in JJY on 40kc, pulse-encoded time signal from Japan at 0615. R-389 UPDATE: Oct 18, 2018 - LW conditions are just getting better and better. 50 stations tuned in about 45 minutes starting about 05:30. DB 341kc Burwash Landing, Yukon, CAN, FS 375kc Ft.Simpson, NWT, CAN along with ZF 356kc Yellowknife, NWT and MM 388kc Ft. McMurray, AB were some of the Canadian NDBs. LLD 353kc Lenai City, HI is a regular every morning. I'm finding that the R-389 maintains excellent sensitivity even with the Bandwidth set to 100 cycles (.1kc.) Using the 100'x135' "T" wire antenna. R-389 UPDATE: Nov 13, 2018 - Listening evenings now that we're back on Standard Time. YY 340kc Mont Joli, QC, Canada, YXL 346kc Sioux Lookout, ON, Canada, IN 353kc International Falls, MN were some of the NDBs heard around 19:30 PST. Also heard MA 326kc Midland, TX which isn't that far away but it's on the same frequency as Canadian powerhouse DC 326kc Princeton, BC, Canada. Also, I'm noticing that I can easily tune in NDB stations between the DGPS nodes located from 285kc up to 325kc in the West. All listening was with the bandwidth set to 100 cycles. Still using the 100'x135' "T" wire antenna as the noise isn't too bad and signals seem very strong using the wire antenna. UPDATE: VFO Problem - January 9, 2019 - This problem started out with just a defective tube in the IF module but seemed to evolve into a major issue. The initial bad tube was the second IF amplifier that had an open heater. Besides the second IF tube, three other tubes then don't have heater voltage since these tubes are connected in series-parallel. I went ahead and tested all of the tubes since it had been about nine months since the last complete test. I found about four more weak tubes - not bad but reading about half of minimum acceptable (I was using the TV-2 tester this time which is more critical in its testing results.) The receiver was then working fine on the bench. Then I installed it back into the CY-979A cabinet and had planned on listening that evening. The evening session turned up another problem. The VFO was now causing the received frequency to be 40kc lower than the frequency readout (at 700kc.) Since the VFO was way off frequency, the rest of the receiver front end was essentially not in alignment so no signals were heard on MW. On the AM BC, strong stations could be heard but they were 40kc lower than they should be. This was the problem I had been having when the VFO oven was turned on. Now it was happening at ambient temperature except there was no "frequency jump" after a "warm-up" as before. I could "tap" on the side of the VFO and the frequency would sometimes jump the 40kc other times it wouldn't. It seemed that something mechanical had happened inside the VFO. Pulling the VFO, removing the outer cover and oven, then the inner cover provided access to the VFO circuit. At first everything looked normal except that it was obvious that the VFO had been opened before and the desiccant packets removed. Closer examination with magnification showed that the rotor of the the trimmer capacitor was covered with white oxidation. Most of the metal parts inside the VFO had some contamination from this white powder. The oxidation seemed to brush off easily using a small stiff paint brush. I thoroughly cleaned the trimmer capacitor including cleaning both sides of each individual plate of the rotor and stator using a thick paper pulled thru the gap of the plates. All solder joints were checked. >>> >>> After a complete cleaning, I reassembled the VFO and installed it into the receiver. Upon power up, the tuned frequency was about 40kc off. I left the receiver turned on for a couple hours and no changes occurred. I then resynchronized the VFO (470kc out at 15kc) and performance was pretty much back to normal. I suspect that the corrosion was "growing" on the plates of the trimmer capacitor and intermittently contacting an adjacent plate (or plates.) The semiconductive nature of the oxidation may have caused a slight capacitance change rather than a short. The heat would cause expansion to increase the clearance enough to eliminate the "contacting" condition. 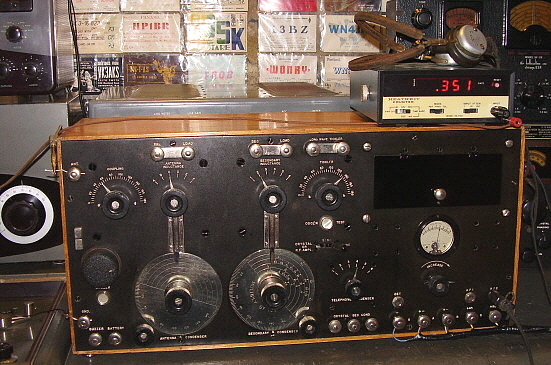 The receiver was originally calibrated for this "non-contacting" condition. When I turned the oven off, the frequency "jump" didn't happen but probably the expansion was going to take much longer to occur so I thought that the problem was solved. The result was that I had calibrated the VFO for the "contacting" condition. For nine months the receiver operated fine and I didn't experience any change in calibration until the IF tube failure and subsequent repair effort. I think the physical movement of removing and installing the receiver into the CY-979 cabinet may have contributed to VFO issue showing up at this time. Cleaning the oxidation in the VFO seems to have cleared up the problem. Since the "contacting" condition is hopefully gone for good, I had to recalibrate the VFO to the new, hopefully permanent, "non-contacting" condition. 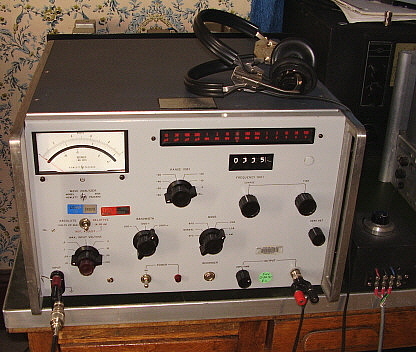 When the first paragraph of the SP-600VLF-31 manual states that the receiver is unique because the tuning "extends to audio frequency 10kc" one wonders whether the writer of the manual understood the difference between 10kc of varying air pressure (sound-audio) and 10kc of radio frequency oscillation (a varying electromagnetic field.) Of course, the writer may have just been thinking of an RMS voltage varying at 10kc. The SP-600VLF is not just a standard SP-600 with LF coils in the turret. It's a very different receiver that was designed specifically for longwave reception. 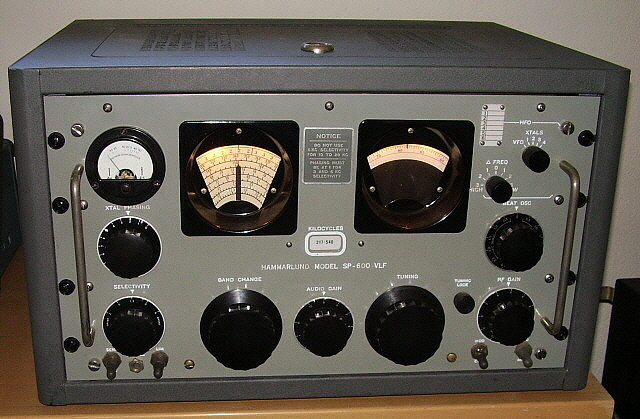 The SP-600VLF-31 was first offered in 1954. It was the first VLF version of the SP-600 series with a later SP-600VLF-38 for 25 to 60~ AC operation being the only other version produced. The receiver shown here is from 1955 (ink-stamped June 27, 1955 on backside of the front panel.) Hammarlund also produced several SP-600VLF receivers for the Dero Research and Development Corporation. These receivers are identical to the SP-600VLF-31 except they will have "Dero Research and Development Corp." with "Model 2F VLF Receiver" engraved on the front panel and there's a small metal etched data plate tag with the Dero name mounted below the Audio Gain control. The Dero example I saw didn't have the Hammarlund data plate mounted on the tuning condenser cover but whether that is normal for all Dero receivers is unknown. The 1950s was a time when the radio frequency spectrum below 500kc was brimming with signals that included many voice transmissions and lots of true CW transmissions. Signals that could be tuned included airport beacons (many with voice weather reports,) maritime weather and navigation signals, ship to ship traffic, ship to shore traffic, long wave AM broadcasting from foreign lands to name just a few. Nothing like today's almost entirely data-driven transmissions that defy decoding, unidentifiable signals of all varieties and the rapidly diminishing and displaced airport beacons (Non-Direction Beacons or NDBs.) 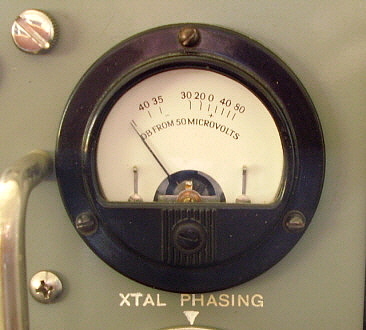 In the 1950s, the SP-600VLF would have been used in the laboratory, in commercial coastal stations or perhaps onboard ship. It was an expensive receiver that probably wouldn't have interested the average radio amateur or average radio listener. It was mainly for laboratory, commercial or military users. Comparison to the HF SP-600s - One notices the although the receiver is obviously a "600" it has several minor physical differences. One first sees that the chassis and most of the sheet metal is gold iridite finish. Also apparent are the quite different side panels used on the VLF (similar to R-390A panels.) 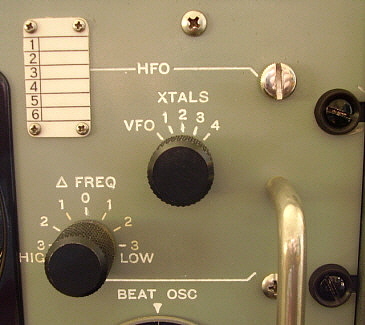 Another difference is the "X" option that on the HF 600 has six positions and uses HC-6 crystals but the VLF has only four positions and uses FT-243 crystals. 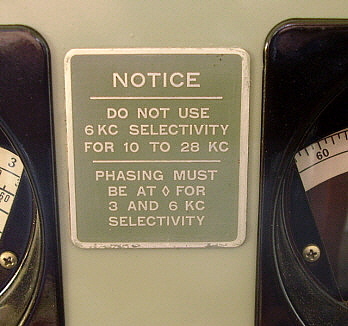 The Carrier Level meter is also only a single scale, bakelite case unit reading "db over 50uV" while the HF 600 meter is usually a metal-cased, dual scale unit. With the dual scale meter, a switch for RF-AF is on the HF 600 that is not necessary on the VLF. A "warning" tag is mounted between the tuning dial and the logging dial There are two additional IF cans that are smaller than the standard IF cans that are for the AVC and for the IF output. The "X" option oscillator uses a different tube. Antenna input is not on the RF platform but is terminals on a rear bracket. 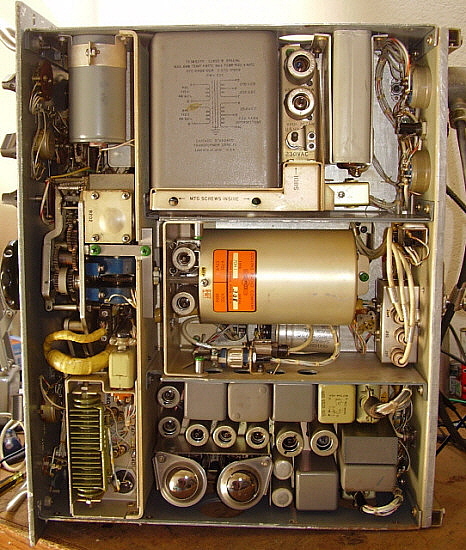 photo above: Note that most of the coupling and decoupling capacitors are ceramic disks on this 1955-built SP-600VLF. VLF Circuit - The SP-600VLF is not just an HF SP-600 with LF coils in the turret. It's a very different receiver. First, it's not a double conversion receiver (like the HF version) but it is double preselection in that two RF amplifiers are used on all bands. The frequency coverage is from 540kc down to 10kc in six bands. 21 tubes are used in the circuit (20 tubes are used in the HF version.) The IF is 705kc and a dual crystal filter is used for selectivity. One crystal filter is ahead of the first IF amplifier and the other crystal filter is ahead of the second IF amplifier. Five different IF bandwidths are available and all positions utilize the crystal filter (the HF version uses three of the six positions for the crystal filter.) There is a 1160kc crystal oscillator circuit in the receiver but this is to heterodyne with the 705kc IF to provide a fixed 455kc IF OUTPUT to drive RTTY devices or other types of equipment that require a 455kc input signal derived from the last IF amplifier stage (full selectivity.) The audio output uses a 600Z ohm transformer that's very similar to the HF version. AVC is provided as is a BFO and there is a Noise Limiter circuit. As expected for the vintage, the 600VLF uses a standard envelope detector circuit so the RF Gain has to be reduced for proper signal to BFO injection ratio (also the AVC should be off.) The "X" function provides for only four crystal channels using FT-243 type crystals. This "X" function provides a crystal controlled oscillator in place of the LO for increased stability. With two RF amplifers and four IF amplifiers provided the SP-600VLF has a lot of sensitivity and a lot of gain - but does that really help in today's noisy LF region of the spectrum? VLF Performance - Noise versus gain - that's the problem. Certainly the number of times that the SP-600VLF receiver will be tuned to a voice modulated carrier signal, with AVC on and the BFO off, will be very limited. AM BC at 540kc and public information BC at 530kc will be about the only AM voice signals easily received. The only other voice modulated carrier signals will be from LW BC stations. Of the LW BC stations that can be heard in the western USA only Radio Rossii was an easy station to receive. Other LW BC were extremely weak so the tuning is done with the BFO on and tune to zero beat. This is called an "exalted carrier" type of reception of AM and it sometimes helps with weak signals. Unfortunately, all I could ever hear was the carrier and the modulation wasn't detectable. Although NDBs are MCW signals, all "NDB-chasers" use a BFO (tuned to the exact IF) to help locate the NDB carrier and then tune to zero beat to copy the MCW (this method results in a nice sounding 400~ note.) Best results for NDBs has the AVC off, BFO on and riding the RF Gain control. Nearly all operation of the SP-600VLF will be with the RF gain throttled back to 5 or 6, Audio gain at about 5 to 7, with the AVC turned off and the BFO on (I've started having the AVC on in an effort to help reduce "pops and crashes" - it helps a little bit is all.) I've found that Selectivity at 1.3kc gives the best signal to noise ratio. The Crystal Filter should be set for narrowest bandwidth (about 8 or 9 on the dial scale.) With high noise it's sometimes better to reduce the Selectivity to the narrowest bandwidth while keeping the Crystal Filter at about 8 or 9. A 600Z ohm headset connected to the 600 Z ohm audio output (not the phone jack) gives the best results for weak signal detection. The Noise Limiter and AVC circuits are not very effective on static bursts or electrical "pops" so keeping the 'phones in front of the ears is necessary during these types of conditions. I'm using a six foot remotely tuned loop antenna. Nearly all of the NDBs tuned in seem to have two or three signals on each frequency. Stations below about 100kc will probably require an outdoor wire antenna for best reception. Stations like JJY (40kc) or WWVB (60kc) can be received with the AVC on and with the BFO off which lets the Carrier Level meter function. In this set-up you can watch the meter respond to the pulse-encoded signal that either station sends out. USN Submarine Fleet comm stations NAA, HOLT, NPM and NLK are very strong MSK Navy VLF stations in the 19kc to 25kc region of the spectrum. MSK stations will require the BFO to be on. No information can be decoded from these stations and their usefulness to LW enthusiasts is that their exact frequency is known along with their location so they provide excellent test signals for the VLF region of the spectrum. My first serious listening session was using my 80M Inverted Vee antenna with the feed line shorted. I logged two newly-heard NDB stations. Not that they were any great DX, being PND 356kc in Portland, OR and BF 362kc in Seattle, WA, but they were new ones (#259 and #260, respectively.) Super smooth tuning with oversize controls only adds to the pleasure of using the SP-600VLF. Chronic Dial Slippage - All SP-600 receivers mechanically drive the tuning using the same set up. A brass drive wheel is rotated with the Tuning knob. This wheel in turn drives, by friction, a brass reduction wheel that is spring-loaded against the drive wheel. The reduction wheel is grooved and mates with the Logging dial driving it, by friction, at its perimeter. If contaminates are allowed to accumulate on the friction drive surfaces eventually dial slippage will be the result. Although some SP-600 enthusiasts believe that the "S" spring used for loading the reduction wheel causes the slipping, I've seldom had just the spring be responsible for dial slippage. Almost always, dirt and grease will have collected on the friction surfaces of the brass wheels or on the rim of the Logging dial and this is what is causing the slippage. Thorough cleaning is necessary to correct the problem. Fortunately, all parts are accessible without any disassembly. The brass wheels and be accessed with the receiver on its side and the Logging dial rim can be accessed from the top. Clean all friction surfaces with denatured alcohol. I use several Q-tips to clean the brass wheel surfaces. Repeat the cleaning until the Q-tips don't turn black. On the rim of the Logging dial, I use a small piece of paper towel that is dampened with denatured alcohol. Again, clean until the towels don't turn black. Remove and check the "S" spring. It should be straight or slightly bent out. If it's bent inwards then the spring load will be somewhat reduced. You can expand the "S" spring by just bending it outwards with your fingers. Reinstall the "S" spring. As an added help, lubricate all of the bearings with a drop of 10W machine oil. Also, check that the Dial Lock is completely open and not "dragging" on the Logging dial. Check the SP-600 tuning now. It should not slip and should be "velvet smooth." UPDATE: Jan. 1, 2018 - The slipping dial is back. Although I haven't pulled the receiver out of the cabinet I can see what I think is the problem. The logging dial rim has a small gouge that I think is causing the slippage since this "dent or gouge" changes the dial friction in the drive wheel groove when the gouge comes around. I also noticed that the logging dial has a significant bend so it isn't really engaging into the drive wheel groove with the same "fit" each revolution of the drive wheel. To repair this will be a receiver out of the cabinet and front panel off since I'll have to dismount the logging dial for straightening and repair of the gouge. I'll do this after the Longwave season is over - probably around March. UPDATE: May 1, 2018 - Slipping dial issue required pulling the receiver out of the cabinet and then disassembling to the point where the front panel could be removed. The dial lamp assembly over the logging dial has to be removed. Then the three screw mounting plate is removed and the logging dial can be removed. Close inspection revealed that near "45" on the dial rim there was a deformation that had a "lumpy" feel to it. Also, between "50" and "55" was another rough area. I carefully dressed these areas with a fine file. The dial also had a warp that was easy to take out with minor flexing of the dial. Upon reinstalling the dial on the hub, I found that the slipping was still happening in the same areas. I readjusted the "S" spring for a greater load against the drive wheel. No improvement. I thought about how improve the "grip" of the brass against brass surfaces and came up with using rosin. I dissolved some powdered rosin in some denatured alcohol to make a thin (viscosity like water) mixture. I used a small paint brush to apply the rosin mixture into the drive wheel groove. Then I rotated the logging dial to transfer some of the rosin mix to the rim of the dial. I let the mix dry (alcohol evaporates.) That did it. No more slipping - at all! I didn't need much rosin-mix, just a little brushed just into the drive wheel groove worked great. If the rosin somehow disappears from the drive wheel groove in the future, it's very easy to reapply the rosin-mix. Hopefully, the "grip" will last for quite awhile. Also, during this rework that required removing the front panel, I noticed that the gray rubber boots over the toggle switches had deteriorated to the point where two of them ripped and came apart. Fortunately these rubber boots are still being made by the same manufacturer and using the same part number. I ordered a new set of four gray boots from Grainger via their eBay listings. The price was $4.50 per boot. The boots are for 15/32"-32 toggle switches and are manufactured by APM HEXSEAL (part number is IN1030.) I know these aren't original but I think these additions improve the front panel appearance and aren't serious deviations from originality. photo above: The unique, iridite-finished side panels of the 600VLF Conclusions - Medium Wave and LF Amateur Operation - NDBs are going "off the air" in droves. LW BC stations are almost totally gone. Loran-C is "long-gone." The spectrum below 500kc is rapidly becoming exclusively data transmissions that require special equipment or computer programs to decode. Nowadays, the SP-600VLF might have become a high-quality receiver that could be used to hear just a few interesting signals. Fortunately, now there are some MW and LF amateur bands that can present a real challenge for the SP-600VLF. Amateur operation on 472kc to 479kc (630M band) requires UTC approval for ham operations. Regulations allow CW and data with 5 watts EIRP. As of March 2018, I've been successfully using the SP-600VLF as the receiver in my 630M station. I'm using a six-foot remotely tuned loop antenna for reception. The station is described in detail with photo in the section "Operating Vintage Gear on 630 Meters" further down this webpage. The SP-600VLF is a "top notch" LW receiver but it's possible that some users may become frustrated by its performance in the high noise level areas that plague many LF enthusiasts. Unless your QTH is in a rural, RF-quite area, special antennas are going to be necessary for practically any receiver that tunes below 500kc and the SP-600VLF is no exception. The user's ability to hear LF signals will benefit greatly by employing a noise-reducing antenna system which generally means using a tuned loop of some kind. In RF-quiet areas, various types of wire antennas can be used,...sometimes,...depending on receiving conditions. SP-600VLF-31 UPDATE: Nov 2014 - Using the Remote Tuned Loop Antenna - I decided to try the six foot remote-tuned loop antenna with the SP-600VLF-31 receiver. The loop suffered a bit during the move down here to Dayton. I had it stored in one the shop garages. I brought the loop out for inspection and found that the wire had come out of the grooves in the combs in several places and there was wire hanging and getting tangled. All that was needed was to straighten out the wire and get it back into the grooves of the combs to get everything looking okay again. During the move I discarded the loop's stand because it was beginning to fall apart. So now I'm without a stand for the antenna but it can set on one of its corners and be propped up against the wall - at least for testing. A new 9vdc battery was installed to get the bias and remote tuning working again. NOTE: As of JAN 31, 2015 - 23 "newly heard" NDBs with the SP-600VLF so far with well-over 200 NDBs logged. Also, the Hawaiian LLD 353kc has been copied more than once - a distance of over 2500miles. The recommended "arrow" placement (position 5) of the Crystal Filter isn't particularly good for NBDs. I find that around position 8 gives better noise reduction and allows weaker signal copy. Once in a while, adjusting to 2 or 3 will increase the bandwidth and the "highs" and sometimes this helps with multiple signals on the same frequency. Feb 4, 2015 - Newly heard NDB is another Hawaiian NDB, POA 332kc copied at 0550PST. Modified the loop again, October 2018 - This time the pickup loop was increased to four turns and it was moved to three inches away from the tuned loop. More gain with the four turns and better selectivity with the increased distance between the pickup and the tuned loop. Trying for better performance on 630M. UPDATE: November 5, 2018 - I had a sked with NO3M on 473kc at 1900 PST. I didn't think I'd be able to hear Eric since his QTH was in Pennsylvania - I've never even heard a NDB from Pennsylvania! Total surprise when I heard "CQ CQ CQ de NO3M NO3M NO3M K." Eric's signal wasn't strong, maybe S3 but it was Q5. I answered the CQ but Eric couldn't hear me. I was using the Hammarlund SP-600VLF and the six foot remotely tuned loop. My transmitter was the ART-13A with CU-32 loading coil to a 163' End Fed Wire. I was amazed that I could actually copy a ham signal that originated almost on the East Coast. As mentioned above,...the SP-600VLF is sensitive and it seems to work well with the loop now that I've modified the pickup loop. I did have a successful two-way QSO with NO3M on December 7th. In the early days of wireless communications, all transmissions were on longwave. After the signing of the Alexander Bill in 1912 moved the amateur operation to 200 meters or below, experimentation into the shorter wavelengths began. Ships and navigation remained in the longwave region, (even today most navigation and submarine communications remain in the LW spectrum.) After WWI, most receivers used were regenerative detectors with two-stage audio amplifiers. Later, TRF stages were added ahead of the detector to further improve weak signal reception. As designs progressed, the superheterodyne did not immediately replace the TRF regenerative receivers on LW. At first, superheterodyne designs used rather low intermediate frequencies that limited coverage of certain segments of the LF bands. 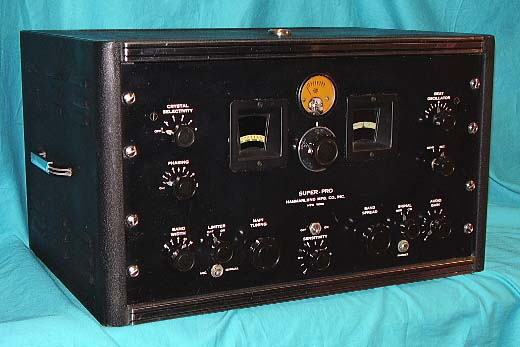 The USN RAA LW superhet receiver from the early 1930s used four different IF stage frequencies to optimize performance and provide complete tuned frequency coverage (10kc to 1000kc.) For full LW (typically 15kc to 600kc) coverage, the regenerative receiver had no such limitations. Later LW superhet designs moved the intermediate frequency above the LW bands to give complete coverage. 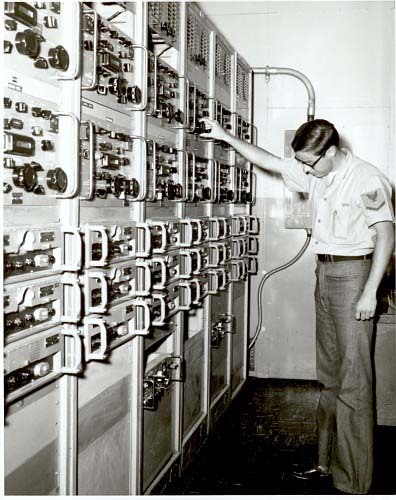 Mentioned above, the RCA-built USN RAA longwave superheterodyne receiver was a gigantic, 465 pound receiver that used 14 tubes and had four different IFs that were individually selected by the bandswitch(s.) Four specifically tuned BFOs were also needed in the RAA. The four different IFs allowed for uninterrupted coverage from 10kc to 1000kc. The complexity and expense of the RAA forced the Navy to reconsider earlier, less complicated and less expensive longwave receivers. After the RAA, all Navy longwave receivers were either TRF with regenerative detector or TRF with tracking BFO. Of the latter catagory is the RBA series built for the Navy during WWII. 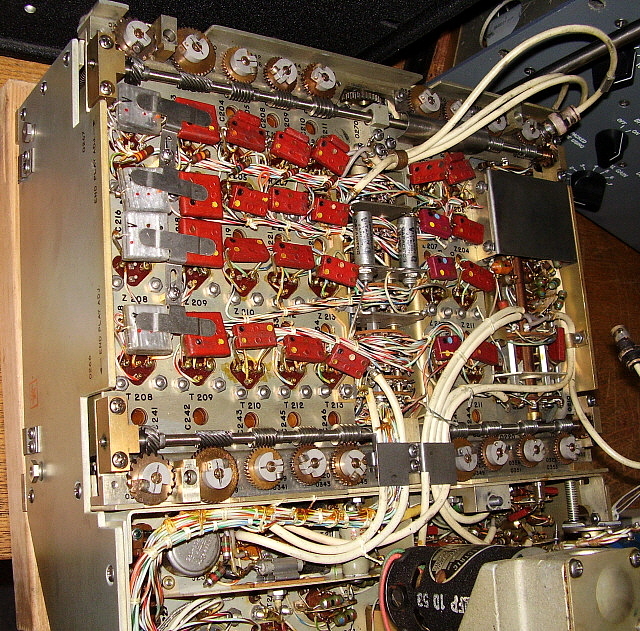 These receivers use three cascade TRF amplifiers feeding a non-regenerative triode detector followed by three audio amplifiers - in essence, the typical TRF receiver of the late twenties. However, that's where the similarity ends. The RBA also uses a "tracking" BFO that tunes via an additional ganged section of the five-gang tuning condenser. This allowed the BFO to always be 1kc above the tuned frequency and provide the heterodyne necessary to demodulate CW. Also, the RBA featured a "tracking" auxiliary gain control that was gear-driven from the tuning mechanism and kept the gain level constant throughout the tuning range. The RBA was used by the Navy for about two decades after WWII ended and its superior performance illustrates what can be accomplished in TRF design when cost was not an issue - the RBAs sold to the Navy for $3000 a piece in the 1940s. Now, all of the above isn't saying that a vintage superheterodyne can't do a good job on LW reception. When specifically designed for LW, with low noise tubes and circuits, a superhet can perform quite well on LW when used with the proper antenna. However, many superhets just added a portion of a LW band to a receiver that was really designed for HF. These types of superhets are common and their LW performance is usually rather poor. There are exceptions with the National HROs (using G, H and J coil sets,) the Hammarlund SP-200LX (aka BC-779) and the RCA AR-88LF (aka CR-91) being noteworthy as high performance superhets that do a fine job on their limited coverage LW bands. Also, there are two well-known, vintage, ultra high-end, designed specifically for LW, receivers that were made for the military and for the laboratory. The Hammarlund SP-600VLF is a top performer with continuous coverage from 10kc up to 540kc and the familiar "SP-600" appearance. However, it isn't just an SP-600 with LW coils installed in the turret but rather it's a completely "designed for LW" receiver that uses the basic SP-600 physical appearance and mechanical features. Unfortunately, the "VLF" is a rather rare and usually expensive version of the SP-600 and, while the SP-600VLF is an exceptional performer, it does require a low-noise antenna and, for LW DX reception, it's really helps to have a low-noise location. The other "high-end" LW receiver is the Collins R-389 LW receiver but it's so rare (856 built) and so expensive that it has become better known as an ultimate "Collins Collector's receiver" than known for its incredible LW performance. 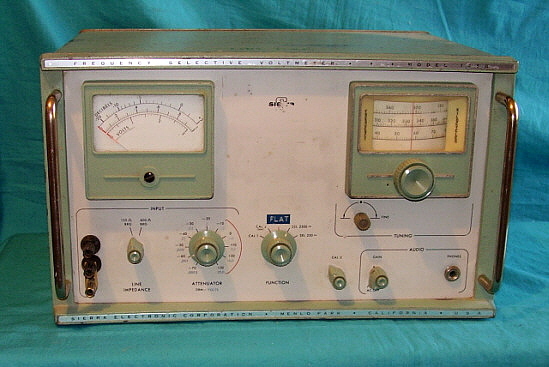 The R-389 is a mechanically and electronically complex, double conversion receiver that mixes the incoming RF LF frequency with a VFO plus crystal oscillator to convert the frequency to an IF of 10mc which is then mixed with the same crystal oscillator to achieve the 455kc IF (similar to the Wadley Loop.) This signal is then routed thru six IF stages using the same type of IF module used in the R-390 receiver. The remaining circuits and modules are the same as the R-390 receiver. The R-389 is another exceptional receiver but many times, its performance is reported as "adequate but not phenomenal." It's likely that many of the R-389 receivers in collections would benefit from a complete servicing since these complex receivers generally don't attain their high-performance capability unless they are well-maintained and expertly aligned by competent techs using laboratory quality test gear. As with any LF receiver, a low-noise location is necessary for LW DX reception. Many casual LW listeners aren't aware that all of the "top performing" LW receivers must be operated with some type of low-noise antenna, even in a RFI-quiet location, to achieve DX reception on LW. In reality, most "high-end" LW receivers have about the same abilities and superior performance is more dependent on the operator's experience, the antenna type used and the receiving location rather than on the type of receiver being used. If the LW superhet user runs his receiver with a tuned loop antenna or a low-noise wire antenna like a Beverage, he will find the signal to noise ratio is greatly improved and, in a quiet location, he should be able to receive ample LW DX. Selective Level Meters and Wave Analyzers are test instruments that incorporate a tunable sensitive receiver with selectable filters and attenuators to drive a calibrated analog meter. These instruments are used for a variety of purposes such as measuring leakage or unwanted signal levels on transmission lines, testing response of various kinds of amplifiers, some types even provide a built-in signal generator for test signals. None of these type of instruments are designed specifically as Longwave receivers, however, some of them actually perform quite well in that function. I have used two Selective Level Meters as LW receivers, a Sierra Model 125B and a model made by Cushman. The Sierra 125B was a vacuum tube model and was fully operational with a good set of tubes and I had performed a full alignment. However, that particular model did not have a BFO to help locate weak NDBs. This made the Sierra 125B very limited in its usefulness as a LW receiver. I also had loan of another selective level meter made by Cushman. This was a solid-state model that did have an on-board BFO with USB and LSB capabilities. It didn't matter, I couldn't pick up any signals using it. The set's owner was also disappointed with the Cushman's performance as a LW receiver and he eventually sold it on eBay. By far, the best instruments for use as longwave receivers are some of the Hewlett-Packard Wave Analyzers. I happen to have the HP 310-A version in which the receiver tunes from 1kc up to 1500kc. The 310-A also has selectable USB or LSB and AM detection along with 200Hz, 1000Hz and 3000Hz selectable bandwidths. Lowest scale sensitivity is 10uv FS meter reading (maximum signal level) although using this sensitivity depends on how much atmospheric noise is present. With a tuned loop antenna, 10uv FS meter can almost always be used. During high noise periods with a wire antenna, 30uv FS provides better noise immunity. In the "Relative" measurement position the sensitivity is adjustable for best response versus noise. The HP 310-A is a late sixties to early seventies vintage instrument with a mechanical counter providing the digital frequency readout. 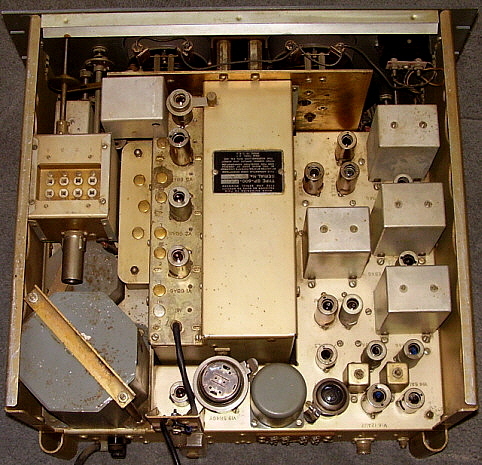 photo left: The Hewlett-Packard 310-A Wave Analyzer. The mechanical digital readout is for receiver frequency while the long horizontal scale illuminates a red numeral depending on the sensitivity (max. signal) selected. The tags above the meter switch are USAF property identification tags. I find that the performance of the HP 310-A is very favorably compared with any of the vintage longwave receivers profiled in this web-article. The 310-A doesn't have a noise limiter - mainly, because noise was one of the things the instrument was designed to measure. However, manipulation of the sensitivity versus the atmospheric noise seems to do pretty well for coping with the lack of a limiter. Since this is a measurement instrument, no AVC is provided, so strong signals will over-drive the 310-A, especially when using a tuned loop antenna. Watch the meter and keep the measured signal level at about 75% to 95% of FS with the Relative Gain control. I have received hundreds of NDBs from all over North America on my HP 310-A, from DDP 391kc in Puerto Rico to LLD 353kc in Hawaii. My conclusion is that Selective Level Meters and Wave Analyzers are designed for finding and measuring leakage in systems, measuring frequency response or measuring unwanted signals on transmission lines and other similar applications. Some of these instruments are useless as longwave receivers. Read up on any instrument you intend to purchase for longwave reception and make sure others have had success using it for that purpose. The first two instruments I tried were of the "useless" variety, however the HP 310-A performs very well as a longwave receiver. All but one of the receivers profiled in Parts 1, 2 and 3 were specifically designed for MW, LF and VLF coverage - generally 600kc down to 15kc. Many other receivers were offered in versions that covered a portion of either the MF or the LF spectrum. During the 1930s, many "All Wave" radios for the home tuned down to 150kc because there was so much to listen to then in that part of the spectrum at that time. Also, a few models of communication receivers were offered with limited MW/LF coverage. Some of these versions were excellent performers while others were barely adequate. The following is a short list, three receivers, that are the best performers with limited MW/LF coverage. None of the receivers listed below cover the entire "longwave" spectrum of 600kc down to 15kc. Using coil sets G - 420kc to 200kc, H - 200kc to 100kc, J - 100kc to 50kc - Very good performer with long wire antenna or loop. These coil sets were generally optional equipment pre-WWII but the WWII military versions did include a complete set of coils, including those for MF/LF coverage. Of these military versions, the HRO-W and the RAS are the most common. LF coil sets can be used in any of the HRO receivers but alignment to the specific receiver is required for best performance. Double preselection (two TRF amplifier stages) are used in all coil sets for the HRO. IF is 456kc on almost all versions. Notice that there is a gap in frequency coverage from 480kc to 420kc (coil set F covers 920kc to 480kc.) This was because of the HRO's IF of 456kc. The RAS used 175kc IF and that allowed it to cover from 195kc up to 500kc without a gap in the frequency coverage (the USN wanted complete coverage in the 400kc to 500kc range which the standard HRO couldn't provide.) The RAS receiver must be used with RAS coil sets identified as coil sets 1 through 7 on a metal tag on the coil panel. Later HROs, like the HRO-50 and HRO-60, can also provide excellent performance using the G, H and J coil sets. The LW coil sets for these later receivers are a bit more difficult to find and are usually somewhat expensive because of that. Photo shows the 1940 HRO Senior. Covers 100kc to 200kc and 200kc to 400kc on the LF and MW bands, 2.5mc to 20mc on HF bands - Excellent with loop antenna, a bit noisy with long wire antenna (depends on your location.) Good dial accuracy. The BC-779 is probably the most popular of the military WWII versions of the SP-200 series. 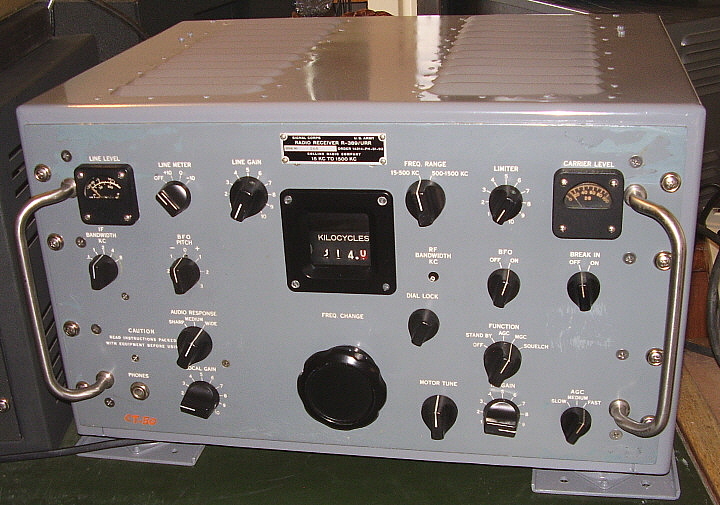 Some BC-779 receivers were built by Howard Radio Co. under contract. Band spread was not provided on the LF or MW frequencies. 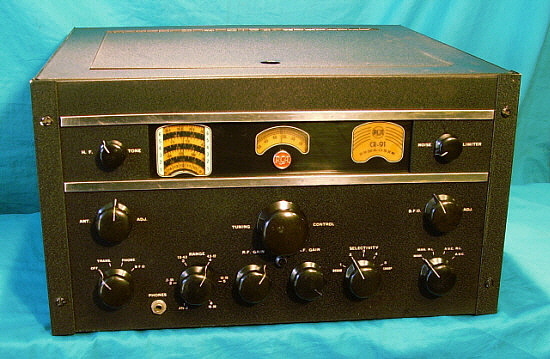 SP-200LX is the designation used for any pre-WWII or non-military version of the "200 Series" receivers. Photo shows the SP-200LX version. IF is 465kc on all versions and double preselection is used on all bands. There was also a SP-100LX version that is an earlier version (1937-38) with the same frequency coverage but this version is rare. Covers 550kc to 73kc (550kc to125kc on AR-88LF version) with SW coverage above 1.5mc up to 32mc - Excellent with long wire antenna or with a loop. Good dial accuracy. A heavy receiver weighing nearly 100 lbs in the cabinet. All steel construction is why. Stability was what RCA was trying to achieve and these receivers have virtually no drift. The AR-88LF versions were generally sent overseas during WWII and are somewhat difficult to find in the USA. The CR-91 is the USA-built replacement for the AR-88LF but it's very rare. Photo shows the USA-built CR-91. Most CR-91s are actually the post-war CR-91A receivers that were built in Canada (RCA-Montreal.) 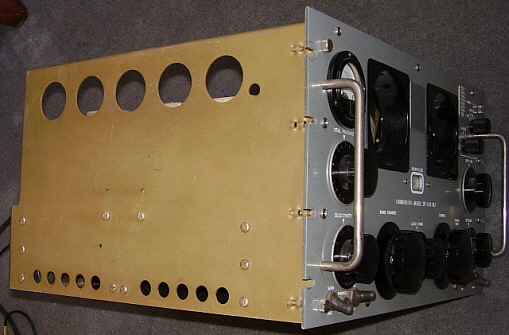 The CR-91A receivers have gray panels and a front panel phasing control. IF is 735kc on all LF versions and double preselection is used on all bands. The Ultimate Vintage Long Wave Receiver? - If you're looking to find the ultimate vintage LW receiver,...the one that's the most sensitive,...the one that can pick up weak DX signals through any sort of noise,...the one that doesn't require special antennas,...well,...unfortunately that receiver doesn't exist. There are very good performers and there are "not so good" performers but there really isn't one receiver that "stands out" above the rest as the ultimate vintage LW receiver. I've tested and used dozens of different kinds of vintage LW receivers and in my opinion the "best" of these types of LW receivers all perform at about the same level. While all of the receivers profiled in the first section of this article can perform quite well on LW, there are a few that standout as my "favorites" to use. My first choice overall would be the Hammarlund SP-600VLF-31 receiver. It's an easy to use, easy to maintain, sensitive LW receiver. An extremely close "second" is the US Navy RBA receiver. The RBA is somewhat difficult to maintain and difficult to set-up because of the separate power supply and armored cable but its sensitivity is phenomenal. My third pick would be the somewhat rare Collins R-389. It's a fantastic LW receiver and I would rate it as "the best LF performer" except it's a paragon of difficulty to maintain and expensive beyond belief. These three receivers are about the best of the vintage LW receivers because all three can detect very weak signals that are "in the noise." All three have direct frequency readout with illuminated dials, the RBA receivers have excellent Output Limiters that are very effective noise limiters and all three have excellent mechanical construction. However, even these three top vintage LW receivers can't perform well within certain environments or when LW receiving conditions are poor. Regardless of the LW receiver used, for effective LW DX reception you absolutely need the following: First and most important is a good receiving location that has very low RFI-noise levels (Radio Frequency Interference, e.g., manmade RF noise.) High RFI-noise areas will limit what even the best receiver can pick-up and separate from the interference. Second, a good low-noise antenna. An antenna that "picks up" a lot of RFI-noise will only compound a noisy location problem, making even the best LW receiver a poor performer. Even in RFI-quiet areas, using a low-noise antenna will benefit your reception. When you have a superb receiver operating in a quite receiving location with a good low-noise antenna then you absolutely must to use headphones for the audio output. Don't use the 'phones jack as the audio source. You must operate the 'phones directly from the 600Z ohm audio output of the receiver. You'll never hear the extremely weak signals using a loudspeaker. 'Phones are a must. Always have the 'phone cups just in front of your ears to protect your hearing from static bursts. Never use rubber cups or padded cushions that surround the ears since this will have the phones in position to direct static bursts directly into the ear canal resulting in "ringing ears" or worst. Always use "bare cups" with the cups in front of the ears. Finally, you must have good receiving conditions and that means you do your LW listening during "the LW season." This would be late-Fall and Winter nights and early mornings (the "LW season" is usually between the Autumnal Equinox and the Vernal Equinox ). The following sub-articles in Part 4 detail some of these MW/LF reception problems and some of the solutions to noise and what types of antennas are best for successful LW reception.